here, or you can download a digital version you can access on desktop, mobile and tablet here. 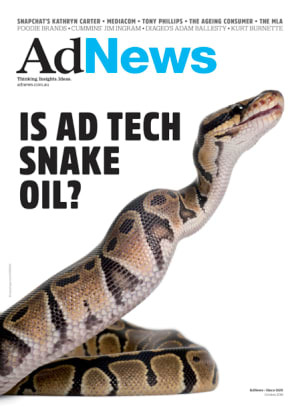 In our cover feature 'Taming the ad tech beast', online editor Pippa Chambers looks into the murky world of ad tech to explore how agencies and marketers can tell the snake oil from the real deal. In Meet the Team we check in with MediaCom CEO Sean Seamer 12 months on from taking the reigns at the agency, which was rocked by scandal and meet five key players in the agency’s turnaround. We sat down with News Corp CMO Tony Philips, Snapchat Australia MD Kathryn Carter and CHE Proximity boss Chris Howatson to offer you a selection of five-minute reads. Creative Choice asks Cummins&Partners Jim Ingram, Clemenger Sydney's Emily Perrett and Diageo marketing boss Adam Ballesty to evaluate creative work from the big banks. As submissions have been made to government following the proposed Media Reform Bill, in The Big Question we ask four key players in the media landscape what they would do if the decision was theirs. Richard Bean, acting ACMA chairman, Kurt Burnette, chief revenue officer of Seven, James Patterson, senator for the Liberal Party and Dentsu Aegis CEO Simon Ryan step up to the plate. Our Special Focus feature looks at the lost generation and why marketers are ignoring consumers once they pass the 50+ mark. In The Work, we take a close look at how, and why, the Meat & Livestock Association tackled diversity. Foodie content is big on the menu. Our Agenda feature takes a look at how publishers are turning to mobile video to sate the appetite for for content. Who has the right recipe to get to the top of the food chain? Ian Perrin gets on his Soapbox to talk about his new agency Speed's modus operandi. Reality Check asks real people what they think of the latest MLA ad. Do they love it as much as creatives do? You can subscribe to the print edition here, or you can download a digital version you can access on desktop, mobile and tablet here. The latest monthly issue of AdNews is hitting desks this week. Here's your snapshot. You can subscribe to the print edition here, or you can download a digital version you can access on desktop, mobile and tablet here.